Where could that next book take you? 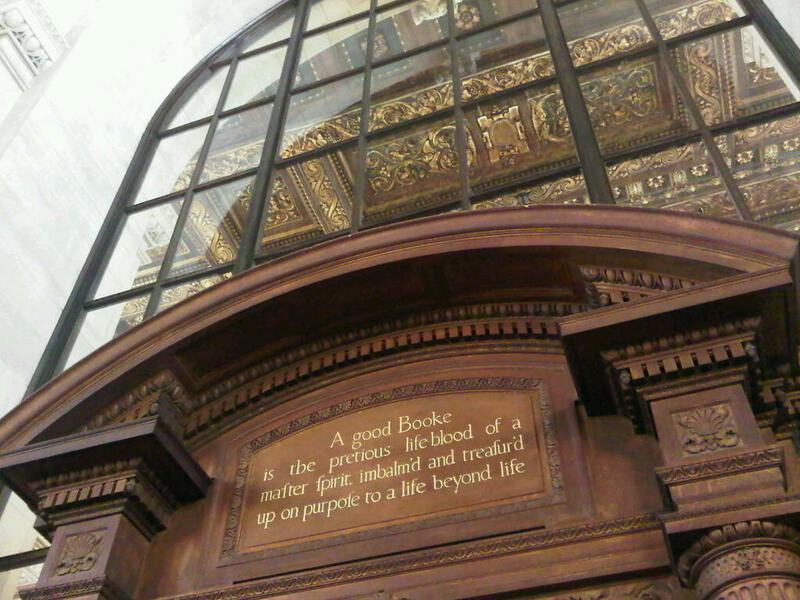 Here I am, at the New York Public library and as I'm walking around, I stopped for this photo. Just 10 minutes ago, I picked up a new book at Barnes and Noble ( Business Model Generation ) and then I saw the quote in the photo below. Now, I'm really curious - where COULD that next book take me? Which kind of work keeps you the busiest? Of all the slides that made it in to the seminar series, here is the most popular, most often requested, of them all. From the start of the presentation, we are exploring the psychology, sociology and technology of productivity. This one slide sums up where we each need to be focused throughout the work day. Look around, how is your space set up to support this? While visiting Papa Lenonn's recently here in Ojai, CA I struck up a conversation with the server about the Gelato freezer. She explained to me that once a week, for a full 24-hour period, they take all the product out of the freezer, unplug it from power, and let it rest over night. They actually move the Gelato from the case into the large freezer in the back of the kitchen, and this allows the freezer time to not work. Looking at that, think about this: at what time of the day, and what day of the week, do you have carved out in the not-to-distant future to not work? My friend Christine Louise Hohlbaum (ok, more of a colleague as we've only collaborated on some writing - she interviewed me for her book, and I read her blog regularly) writes about slowing down. Here's one of her recent articles, timely, as it's Friday! Whenever I read some of Christine's stuff, I remember to take a break. Realizing how easy it is (for some of us) to stay "busy," in the action of it all, it my be worth it to allocate even a few minutes a day (up to an hour or so per week?) in any/all of those other three areas. Can you start the day "ahead of the game" with this one tip? How long ago did you eat your evening meal? And, what have you "added to the tank" since you've been working this morning? 1. Ask yourself how important, on a scale of 1-10, you think eating breakfast is for you. Do you believe that you only need "a little something" (like I hear people say), or do you need something of significance (like I know I need for me)? 2. For the next 5 days, experiment with changing/amending your approach to breakfast. Do you need to wake up 15 minutes earlier? Do you need to get off at one subway stop earlier (or later)? Do you need to bring something from home with you to the office? Do you need to go to the store today after work? 3. 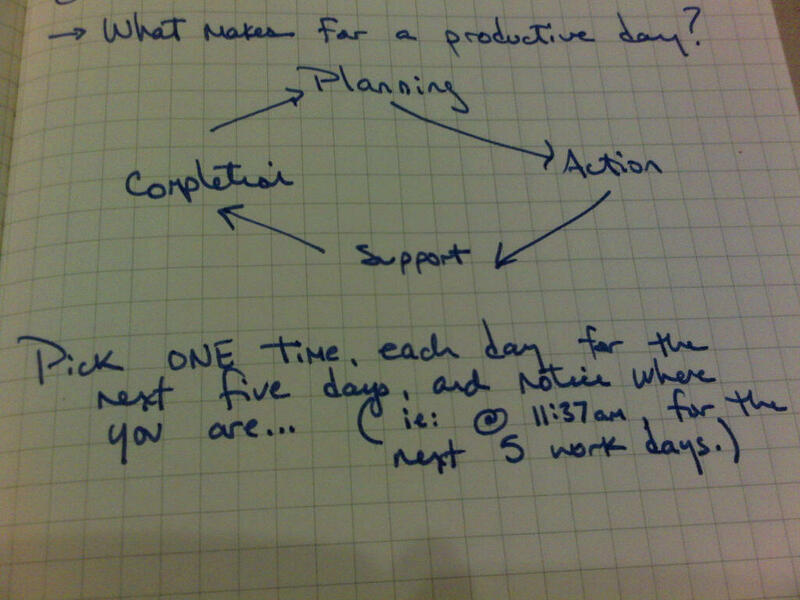 Write a note on your calendar, 45 or 60 days in the future, to re-view your "starting-of-the-day" routines. By that time, it might be worth it to reevaluate what you're doing at the BEGINNING of the day, to make it a BETTER day. 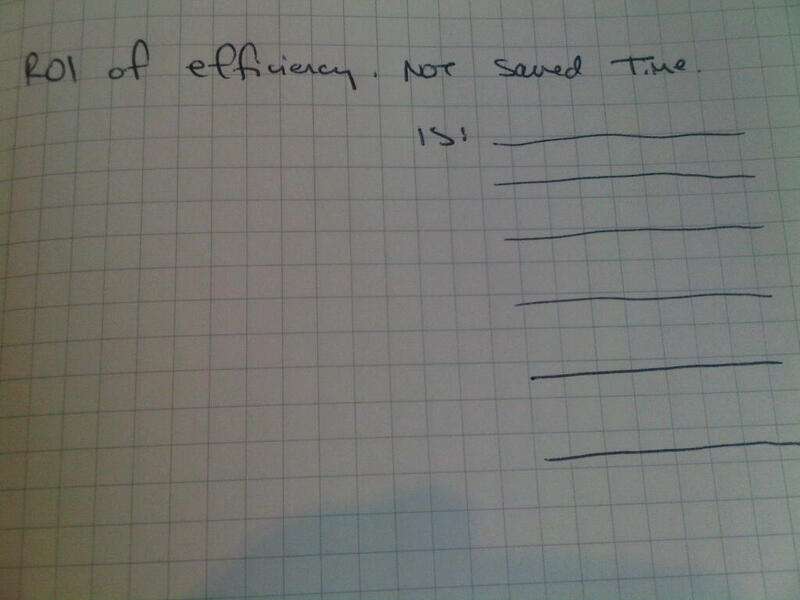 Today's "crowdsourcing" contest "ROI on efficiency is..."
Let us know what you think goes in the blank lines. Send them in, and the best answers will earn the sender a choice of product from our webstore (http://www.womackcompany.com). Seriously, top prize worth $125.00! What are you handing off, and how do you do that? If you walked back (mentally or physically) to the person or people you saw in a recent meeting, would you have something to review? Did you hand something off to them, or ask them to do something that they may need some more information to complete/work on? In a typical work-week, informal and formal "hand offs" happen. We send a quick email, leave someone a voicemail, or ask them something as we pass their desk/office on our way to lunch. Stop, look around, and see if there is something to review. Also, next time you ask someone for something, observe how you do that. When you focus on something, it tends to show up all over the place! What is a goal, a dream, or an idea you've been considering this year? You know, it's almost August...of 2010! Last week, in Zurich, I was walking around the lake, and "happened" to come across the Zurich Triathlon. Ok, ok...I knew it was going on and wanted to walk over and cheer on the athletes. If you "are something," "enjoy something," "believe in something," you'll start to see it all over the place. As an experiment, pick a goal you'd like to achieve this year. Take a picture of yourself in front of it, buy a book or two about it, schedule a #CoffeeChat or lunch with someone to talk about it. Then, watch as it starts to unfold! Just a view of one of the streets of Zurich. Amazing how it is all combined: the plants, the paintings and the flags...a lot to take in! The past couple of months challenged my race preparation and training regimen. Racing triathlon last year to this year, I experienced some changes. I placed in 3 of the 6 races I participated in during 2009...this year, I'm completing (not competing in) my races. So, "how was New York?" people have been asking. Well, to give a general summary, here you go! I arrived in New York on Wednesday evening, as clients had flown me in to speak in their companies on Thursday and Friday (always nice to mix my two passions: Performance...on and off the field!). My seminars and coaching programs went great both days, I got plenty of rest each night, and as it was especially warm in NYC, I drank as much water as possible! Saturday arrived, and I walked from my hotel over to the race registration hotel, and sat through the first orientation of the morning. "Get into transition early, we close at 5:45am..."
"The Hudson was measured today at 74.5 degrees, we think it will be a wetsuit-legal race..."